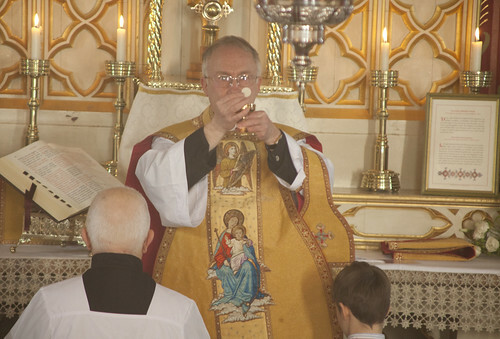 LMS Chairman: Will Pope Francis come after the Traditional Mass? Will Pope Francis come after the Traditional Mass? A recent Missa Cantata in Holy Trinity, Hethe, in Oxfordshire. Having seen this story on Rorate Caeli and elsewhere, my own feeling, which I concede is very fallible and certainly isn't based on any very special intelligence gathered in Rome, is that Pope Francis isn't going suddenly to open up another front in the conflict he is currently engaged in. I don't see why that would make sense to him, at this point. So that's the story, and it may be true or not: it's just a rumour. My thought, however, is that a move against Liturgiam authenticam would be difficult - not, of course, impossible - for a number of reasons. One is the fact that it has been in force for so long, since 2001, and has already decisively influenced the new English translation, so to make a practical difference a new document would have to be followed by a new translation. Given the effort and trouble the last great translation battle required and caused I think Pope Francis is the last person who is going to do that. He doesn't have enough interest in the liturgy to think that effort and trouble worth while, and has other matters on his mind. 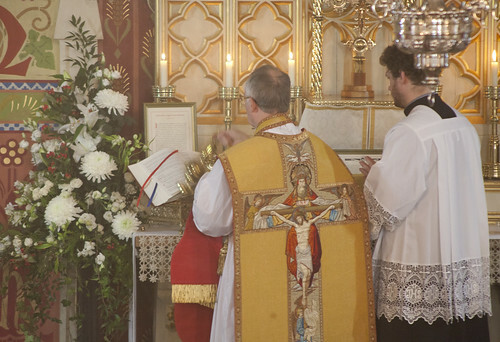 But without a new English translation of the Missal, or other major new translations, a replacement for Liturgiam authenticam will simply be a piece of paper with no effect. Another factor is that Archbishop Roche was very much involved in the last English translation, and it would be a bit strange - not impossible, of course, people can change their minds - for him to set about destroying his own work. And finally, Archbishop Roche is only the Secretary of the Congregation, and a new document against the Benedictine reforms, coming through the CDW, is hardly going to happen while Cardinal Sarah is in charge. Pope Francis could remove Sarah at any time, but up to now he has not done so, and whatever reasons he may have had for appointing him (quite recently, of course) seem still to be valid. I am also sceptical about the idea that Pope Francis will go after the Traditional Mass after saying so often that he has no intention of doing so, and of making such concessions to the SSPX. I think these sorts of stories come from people around Pope Francis who would like them to be true, perhaps even with a view to menacing potentially awkward people into quiescence. But the Pope has, in his confusing way, been quite consistent about his programme, and is now very deeply involved in the effort to make it work, against notable opposition. His programme is about making concessions, whether rhetorical or substantive, to divorcees and others living on the margins of the Church. He has never shown any great interest in the liturgy, and celebrates ad orientem as well as versus populum in the Sistine Chapel. Nevertheless, it is never a bad time to think about what we can do to be ready for any attack on the Traditional liturgy. One thing I have been doing with the Position Papers is trying to show how that liturgy can be of real value to the Church, in the proclamation of the Gospel in Africa, in China, to men, and to children. The list is not going to stop there. This is one way to counter the idea that the Traditional Mass can or should be confined to any kind of ghetto. It is not a dead thing to be allowed for a strange but thankfully dwindling group of people who can't cope without it because of some psychological defect. It is, on the contrary, a resource for the Church in carrying out her divine mission. to believe in them and love and live by them will not be taken seriously. If he did i would be 100% SSPX and dispense with the Conciliar Novus Ordo charade! You haven't already dispensed with it? I did years ago, I linger in the Trad environment just waiting out Francis and waiting on the chastisement which will straighten everything out. It might be amusing to see the Francisdozer stuck in the mud of the neverending, novus ordo liturgical translations quagmire. It might be his Russia, you never know. An apt metaphor all around! Hilary.Spot on!I detect the devil is having his way with Bergoglio at this moment but it won't last.If he goes for the Latin Mass then he will destroy himself,if not before. Joseph I disagreed with your criticism of the CTS translation and your comparison of it and the LMS translation.That hardly counts as untiring criticism of the LMS translation. I agree with Liturgiam authenticam which is why I believe the LMS should have adopted as its model the OF translation which was issued in accordance with LA. I entirely agree that love of the traditional rite is not and should not be confined to a liturgical Ghetto but I fear that the LMS translation indicates a preference for the Ghetto rather than being part of the Church as a whole. QED, up you pop wth the same criticisms as before. If you agree with LA, then you'll realise that the LMS does better in its terms than Vox Clara, which was trying to make concessions to people who rejected LA. As well as refelectimg the new OF translation in many ways. While it's risky to open up another front, sometimes throwing as much stuff out to see what sticks is also an effective strategy. While everyone is fighting separate fires in a divided way, things are being burned down so that over all total damage is greater and harder to reverse than if only one front was focused on. Just look at the Spirit of Vatican II Pope John Paul II and Pope Benedict attempted to fight on as many fronts as they could to preserve and restore the faith, yet there were so many fronts opening up that we still had a decline. All Pope Francis would need to do is write an ambiguous encyclical "Liturgiam Laetitia" which on the surface affirms everything Pope Benedict XVI was trying to do, yet leaves enough room so that it implies that every bishop and priest can "for pastoral reasons" adjust the liturgy to "accompany his parish towards encountering God in a way best suited to that parish". It could even be in a footnote. It doesn't matter. Polka clown barbecue masses suddenly become "possible". When questions arise, all that would be required is for Pope Francis to direct questions on interpretation to someone other than Cardinal Sarah. We need to prepare ourselves and fortify our priests, especially the average "go with the flow priest" that really wants to be liked and be reasonably faithful given the constraints of Rome. It's so easy for the average "go with the flow priest" priest to be bullied into liturgical creativity if they don't have opposite support to stand their ground. Evidently Pope Francis saw this if nobody else did. The rest is history: Cardinal Sarah's entire staff replaced and a public announcement that there is to be no reform of the reform. A broad overview of pastoral activity is then given focusing on the different roles of those involved in the caring for the vocational discernment of young people. If the pattern of the last Synod holds, then what we read here will already be contained in the papal exhortation that follows, no matter what the bishops may say. The revolution must forge ahead. The last piece of the jigsaw is SSPX who need to be enticed into the official Church. Once that happens then Pope Francis will crush tradition by means of the bishops' conférences who will whoop with delight. If SSPX can be seen to be uncooperative in response to invitations then they can be isolated outside the Church. The point is that Rome will try to say that SSPX were never serious about a deal and are therefore schismatic. THis is why Bishop Fellay has to appear agreeable to a deal even though he knows that such a thing is impossible. Pray for him! There is a new translation of the Liturgy of the Hours in the works. They started right after the new Mass translation, so hopefully it's moving along, but perhaps this talk of yet different new translation guidelines will cause them to start over again on that too. As a layman I'm not bound to pray the office, but anyway find the current one uninspiring, and would try to pick it up if there were a better translation.